For a while there it looked like Aerosmith were done. Steven Tyler had fallen off the wagon (and subsequently the stage), and at some point he was in consideration for a proposed Led Zeppelin tour in the absence of an unenthusiastic Robert Plant. Along the way bass player Tom Hamilton was diagnosed with throat and tongue cancer (he recovered but the cancer returned last year, and after treatment he’s recovering well). And of course Tyler went off and took a job as a judge on American Idol too. When the band finally reconvened and hit the studio, the question was “Which Aerosmith will be making an album? The 70s bluesy rockers? The 80s/90s hard rock superstars? The FM smash balladeers?” It turns out the answer was “All of them.” Music From Another Dimension! manages to have something to appeal to fans of all three of the band’s main eras, and with 15 tracks on the standard edition it’s pretty much a case of “If you don’t like the ballads, there’s plenty of the other stuff.” Whether intentional or not, Aerosmith seems to have found a way to please everyone. Hi! Have you had a chance to listen to the record? Yeah! I like that there’s three Aerosmiths here – the 70s feel, the 80s/90s stuff and the ballads. Something for everyone who likes something about Aerosmith. Yeah, I noticed that’s how it came out. Every era of our career is represented. I don’t think it was a conscious decision. We’ve learned that it’s so much about songs, and we’ve dipped into different styles throughout our career. What always comes back is it’s all about songs. We want to have really kickin’ drums and blasting guitars, and Steven singing amazing vocals. And I’m a musician so sometimes I’ll listen to music just for the bass player, but not that often. I really believe that the song is the thing. 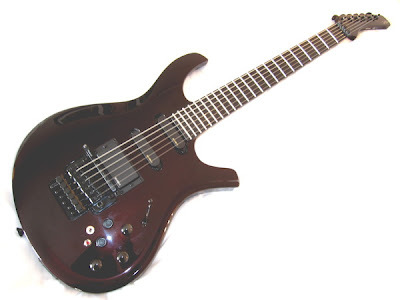 It has a mahogany body reinforced with carbon fiber glass epoxy with a Parker 7 string bridge, a Seymour-Duncan Distortion SH6N pickup in the neck position and a Seymour-Duncan Distortion TB6 in the bridge position. Oh and there are Ghost piezo saddles with a MIDI preamp. Available in dusty black, galaxy grey, and metallic red, all in gloss finish. It’s a big year for Living Colour fans, with the release of the new album The Chair In The Door on September 15 (more info here, or keep reading to see video of one of the tracks performed live) and the new Parker DF824VR Dragon Fly. Can’t wait to try this one out! Vernon Reid is best known for his role in Living Colour, which he founded in 1984. The DF824VR was crafted in his honor. The DF824VR is constructed of a poplar body, top and neck with a Parker Finger Joint set neck, and carbon composite fretboard. The DF824VR has a Floyd Rose original bridge, Grover tuners, EMG SAX neck and middle pickup and an EMG 81X bridge pickup. Available now in a violet pearl and black cherry finish with black hardware. Grammy-nominated heavy metal group Killswitch Engage has become one of the hottest touring bands since they hit the charts in 2004 thanks to influential guitarist, Adam Dutkiewicz. Parker teamed up with Dutkiewicz to create a guitar that reflects his extremely articulate yet wild and unpredicatable style. The DF842AD is expertly crafted of a mahogany body and top, mahogany neck with a Parker Finger Joint set neck, and carbon composite fretboard. Additional features include a Parker Tremelo bridge, Sperzel locking tuners, an EMG 85 pickup and an EMG 81 bridge pickup. Available now in black ice and dusty black finish with black hardware. For more info, visit parkerguitars.com and Premier Guitar, and thanks to Guitar Noize for once again retweeting awesome news! Man, you’re on it today! If you’re following Living Colour’s Vernon Reid on Twitter you have probably already seen this. If not, here’s prototype #1 of the Parker Vernon Reid Dragon Fly. Looks like it’s shaping up to be a very versatile and innovative guitar. Can’t wait for further updates!